Now available in beta ... to receive a web-based copy of the tool in please fill out the request form. This Long-Course Triathlon Nutrition Evaluation tool allows very simple entry of an athlete's Nutrition Plan based upon an extensive Food Library which the user is able to add to. The database contains all nutrition data of value to triathletes, including the full spectrum of electrolytes, plus approximate Glycemic Index, which allows calculation of the approximate rate of carbohydrate absorption (below). Graphs and tables for all pertinent metrics are provided, so it's trivial to use the drop-down menus to tweak the plan and then re-evaluate the outputs. The tool is entirely cloud-based residing in the user's Google-drive (if they have one, though it's not necessary). The tool can store data for several races simultaneously. Athletes are encouraged to avoid caffeine pre-race so as to exploit its performance-enhancing gains, however above about 3mg/Kg there are no more benefits, and there are downsides to having too much, while being too low will cause you to miss out on potential benefits. Calculating the optimal amount to take, and at what times, is made harder by the approximately 5 hr half-life (the time for 50% to dissipate). 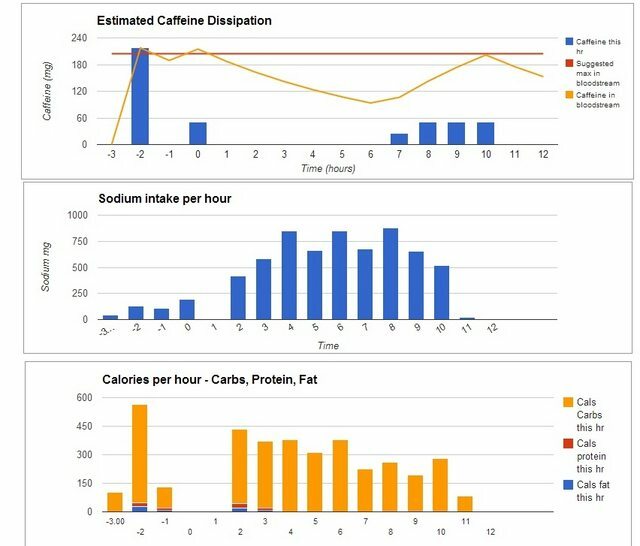 This tool does those calculations for you, so you can easily plan your caffeine intake.